The Giant Trance X29 1 is the middle bike in Giant’s new long-travel 29er range, and promises to be everything we loved about the 26in Trance X — just re-engineered for bigger wheels. Part of that re-engineering process was to stop the chainstay length from creeping up. By switching to a single-sided swingarm upright, Giant has managed to pull the rear wheel forward a hair to give a 455mm chainstay length. It’s hardly short, but Giant is obviously confident that the new ‘single-spar’ swingarm is stiff enough, as the Trance X29 retains regular quick-release dropouts. Up front, Giant uses a custom upper headset assembly to squeeze its dedicated OverDrive 2 (1.5in to 1 1/4in) tapered fork steerer into the regular tapered head tube. Giant claims that this, combined with the OverDrive 2 stem, increases torsional steering stiffness by up to 30 per cent. Needless to say, the 120mm Fox Float fork on the front of the Trance X29 1 felt stout. It’s super-plush too, but the CTD damper didn’t offer much in the way of control, so we ran it in Trail; Descend mode simply didn’t offer enough front-end support for, um… descending. The 127mm Maestro rear suspension was equally plush, too soft even, and we suspect that the air volume of the Fox Float CTD shock is too large, or perhaps the compression tune is too light, as even in Climb mode, the rear suspension is not super-firm. Schwalbe’s fastest-rolling PaceStar tyre compound means that the Trance X29 is light to pedal and fast in a straight line. Cornering grip, however, can be hit and miss, especially if there are sniper roots hiding under fresh leaf fall. The combination of SRAM X7 shifter pods and an X9 Type-2 clutch rear mech means that the shifting was much stiffer on the Giant than on the Shimano-equipped bikes or the higher-specced Whyte T-129s. More annoyingly, SRAM’s Type-2 rear derailleur makes a loud clunking sound every time the suspension compresses, because the lower section of the chain tugs on the rear mech and causes the clutch to release. This, combined with the cables rattling inside the frame, made our new test rig sound more like an old beater. It’s great getting a dropper post as standard, but Giant has been too quick to ditch the seatpost QR, as we found the 100mm drop simply wasn’t enough for the steepest trails. A 730mm bar with a good profile is a boon on any trail bike, and the 90mm stem matched the proportions of the size M frame, even if we had to flip it to get the front-end low enough for climbing. 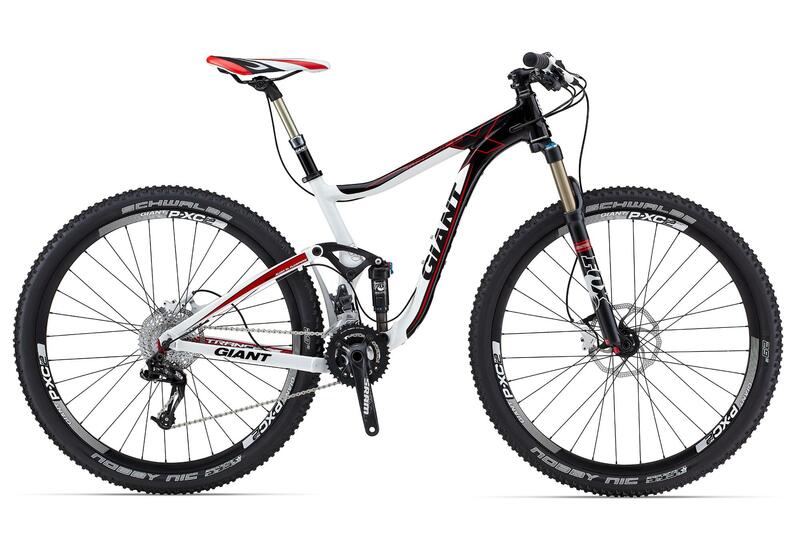 Giant offers the OverDrive 2 stem in a range of lengths, the shortest being 70mm. We were constantly fettling with the suspension on the Giant, and never found a set-up that we were 100 per cent happy with. At lower speeds, the bike tended to pitch and wallow, even with the front and rear suspension set to Trail mode. The rear end felt too soft; combined with the more rearward saddle position, we struggled to keep the front on track when climbing. On high-speed descents, the 127mm rear suspension proved very effective at gobbling up the square-edge hits and felt more stable when pedalling hard, rather than simply spinning along or freewheeling. This makes this bike most rewarding when ridden aggressively, but you need to have the motor to maintain that effort; each time we backed off, our enthusiasm for the Trance X29 1 started to wane. As Giant’s first foray into longer-travel 29ers, the Trance X29er 1 ticks a lot of boxes: it’s comparatively light, the frame is stiff, it’s comfortable to ride and comes dressed in all the latest must-have gear, including a dropper post and 730mm wide bar. But it’s not quite perfect. We never really gelled with the bike and it’s probably due to the proportions of the frame (the medium being a tad short at the front) and not managing to find a balanced suspension set-up. So while the Trance X29 1 is solid, and arguably more capable than the 26in version, it’s nothing like as inspiring to ride. This test appeared in the January 2013 issue of MBR, head to head with the Diamondback Sortie Niner 2, Whyte T-129s, Scott Spark 950 and Specialized Camber Comp.